﻿ When Should You Sell Your Gold? 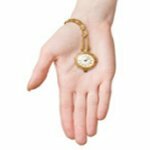 If you are hanging on to your old gold jewelry, gold scrap, gold coins, or other gold items, unsure of whether or not to sell them for cash, then don’t wait too long – you may be disappointed with your cash return. Gold is selling at historic highs at present, but no one knows when the price will start dropping. By selling your gold now, you can take advantage of these high gold values. If you wait, it may be too late. Even is you do not keep up with the financial markets, you have probably heard about the extreme fluctuations that the gold market has experienced lately. The gold market has seen percentage changes in the double digits in a matter of days for several weeks, resulting in wild variations in the value of gold, and more fluctuations like these are expected for the near future. While the price of gold on the market is expected to stay high, these market variations indicate that getting the best price for your gold may depend on selling now. However, one thing about gold has remained constant throughout these market variations – financial advisors are recommending those with gold to sell now. The best way to protect yourself and your gold investment while also maximizing the value of your gold is to sell now, while the value of gold is high. Gold prices soar in times of economic uncertainty and rising inflation, and given both are represented in our current time, investors whom seek safety are heading into the shiny metal to commemorate its reputation to be the safest among all investments. While it is historically true that gold values do significantly increase in tandem with uncertain economic outlooks and inflation, it is also true that the market can experience extreme variations during these times. Investors will look to gold as a solid investment during uncertain economic times and inflationary markets, but the fluctuations in the market will nonetheless affect gold’s value, which makes selling gold while the value is high imperative. If you study the 30 day history of gold on the market, available here , you will note two distinct patterns – one, that gold has made huge gains in the past 30 days, and two, that the price has often bottomed out in a matter of days or even hours. While this graph indicates that gold has lately made gains, it is now on the downswing, and it’s not out of the question that the price will continue to drop. Therefore, selling gold now, while its value is still relatively high, only makes sense. If you are interested in selling your gold now, while values are still at historic highs, contact a gold broker. A gold broker will give you cash for your old gold jewelry, gold scrap, gold coins, and other gold items. The most convenient and easy way to sell your gold is through an online gold broker. Using an online gold broker to get cash for your gold eliminates the need to search for a reputable local gold broker, which may be difficult to find in smaller markets and rural areas, while also saving you time and money. Selling your gold to an online broker is a safe, secure method of getting cash for gold while the value of gold is still high. It’s as simple as contacting the gold broker, requesting a gold kit, and dropping the insured mailer in your mailbox. The gold broker will then give you an appraisal for your items, and if you decide to sell, the broker will then make payment for your gold. The fluctuations that the gold market has experienced lately are likely to continue in the near future. While gold may continue to grow in value, it is altogether possible that it will begin to drop in value. Don’t hedge your bets against the gold market and risk having your gold decrease in value. Sell now while the prices are at all-time highs. You have nothing to lose by selling your gold now. If you wait, you may be disappointed to find that the same gold you could have sold now while the market is at an all time high is worth less than it was just months – or days – previously. Don’t wait – contact an online gold broker and sell your gold today.